VOL. III. THURSDAY, 30TH JANUARY, 1958. No 7. Notices. telecommunications and on all mat- Hospital resigned appointment. ters in connection with the public 31st December 1957. Benjamin, Miss V., Staff Nurse, HolIt is hereby notified for general Mr. Millard is expected to sail herton Hospital, resigned appointinformation that His Excellency the from the United Kingdom on 5th ment. Feb. 12. Governor has issued a Commission to February, 1958. His Honour Lt.-Col. ALEC LOVELACE, Cochrane, W. S., Fishery Assistant, apM.B.E., M.C., Administrator of Administrator's Offwe pointed Senior Clerk, AdministraAntigua. appointing him to be his Antigua. tion. January 20. E x c e I I e n c y is accompanying the Holberton Hospital. Jai. 1. Chief Secretary's Office, of the British Virgini Islands has been) Hospital on contract for 2 years. 26th January, 1958. pleased to re-appoint the following Jan. .
persons to the Building Authority for Flax. G. W., Senior Clerk, AdministraRef. No. 13/0035!). one year with effect from 15th Jan- tion appointed Principal, Treasury. tion that under the provisions of Mr. E. L. SMITH Chairman Hlerk, Central Houming and PlanRegulation 3 of the Antigua Public Hon. LESLIE MALONE, M.L.C. ning Authority. Nov. 21 1957. 1956, His Excellency the Governor The composition of the Board is now transferred to the Audit Departhas been pleased to reappoint as follows: ment. January 20.
the Colony of Antigua. Senior Clerk in that Department. The Superintendent of Public Sept. 1 1957. 27th January, 19.58. No. 9. Clerk, Audit Departmnt. Jan.22. has appointed Mr. Charles Arthur Antigua. appointed Senior Clerk, Treasury. Millard retired Electrical Engineer, Ambrose, H. B., Senior Clerk, Peasant January 1.
instance. Anthonyson, H. T., Junior Clerk, from the Colony of Barbados. Treasury, appointed Senior Clerk, January 11.
electricity service; to the Treasury. January 16. Barnard, Miss D. L., Junior Clerk, Cus(b) the operation of the public toms, transferred to the Audit Michael, Miss M. E., appointed Operatelephone service; and Department. January 20. tor, Telephone Department. Jan. 8.
pointed Principal, Audit (Antigua marked PUBLIC SERVICE VEHICLES of the said two members. Clerk, Treasury, on probation. bring their vehicles to the north 1958. Jlonitserrat for whom the vehicle was called. Returning Officer. Roberts, A. A., Station Sergeant of 6. Private vehicles will be parked (Elections to the House of RepreRoberts, A. A., Station Sergeant of in the public parking lot situated west sentatives of the West Indies) ReguPolice, Antigua, to act Inspector of of the airline offices. lations, 1957, (Montserrat S. R. & O.
Mordeat Gontro g Qcer. ~SOUTH, East and West by the sea. private driven motor vehicles opera- 24th January, 1958, the summit of Farrell's Mountain. 3. Unless a particular vehicle is and between the hours of two o'clock EAST--by the Western boundary stipulated by a passenger, public ser- and four o'clock in the afternoon at of the Windward Electoral district vice vehicles will be called in the the Princess Elizabeth Hall in the WEST-by the sea. HEALTH, who are on the pensionable establishAll tlat portion o(f the Island of MARKET STREET, mnenl of theCivilServices. Montserrat bounded as follows:- 17th January, 1958. (Section 50 (2) a & b). direction to the mouth of Bottomless one coming in possession of the the production of receipts or other Gut. unaccounted receipts should report bona fide evidence. by the removal, either wilfully, or No. 13 of 1957. exceeding six months. slaGovernment views these acts of shall deliver a true and correct return dred Dollars, or to imprisonment with Government views these acts o of his whole income to the Commis- or without hard labour for a term not vandalism seriously and anyone sioner not lter than the 31st day of exceeding six months. caught in the act of removing any of siner not later than the 31st day of exceeding six months. these clips will be prosecuted. January 1958. (Section 74). invited in an effort to suppress and No. 13). for the Commissioner. eradicate this dangerous practice and 4th January 1958.
and prosecution of the offenders, deliver a true and correct return of his BRITISH VIRGIN ISLANDS. Administrator's Ofice, hole income not later than the 31st 3rd January, 1958. Antigua. day of March, 1958.
returning Friday weather permitting. income not later thent the 31st day of lubricating oil and grease. 4. entrustenders should be addressed Contractors, Merchants, Estate Pro- Application. Administrator's Office, sub-contractors) whose total remuner- Trade Mark. Ref. No. A. 6216. Government Departments are not Registrar of Trade Marks. 34 THE ANTIGUA, MON rSERB.AT AND VIRGIN ISLANDS GAZETTE. [January 30, 1958.
or more of the foregoing; remote value authorised for use in the Colony various branches of the otfice. control sy st e ms; p o w e r of Antigua. transducers including phonograph Antigua. branch, and preparation of draft recartridges, loudspeakers, microphones plies, despatches etc. etc. wave traps, filters and noise sup- EstimatorlChief Draughtsman after office hours. arresters; antennas; voltage dividers; St. Vincent. material etc. The applicants claim thalt Ihey have other recognised authority, to the Chief Secretary. Any person may within three the assistant Administrator and by the Chief Secretary. of he said Trade Mark. ably qualified candidates for appoint- Government officials are liable to taxEVAN CREQUE, ment to the post of Assistant Secretary ation imposed by local enactments. Antigua appointment carries with it liability 1958. TRADE MARKS OFFICE, ANTIGUA, 31st December, 1957.
in Class 43, that is to say: Whisky. The Applicants claim that they have used the said Trade Mark in respect of the said goods for 3 years & 6 months 11 years and 132 years respectively before the date of their said Application. Any person may within three months from the date of the first appearance of this Advertisement in the Antigua, Montserrat and Virgin Islands, Gazette give notice in duplicate at the Trade Marks Office, Antigna, of. opposition to registration of the said Trade Mark. 36 THE ANTIGUIA, MONTSERRAT AND VIRGIN ISLANDS GAZETTE. [January 30, 1958. TRADE MARKS OFFICE, TORTOLA, B.V.I., 18th July, 1957.
in class 2, that is to say: Chemical substances used for agricultural, horticultural, veterinary and sanitary purposes. in Class 13, that is to say: Metal goods not included in other classes, in particular sprayers, squirt guns and atomizers.The Applicants claim that they have used the said Trade Marks in respect of the said goods for six years before the date of their said Application. 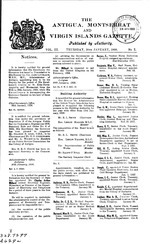 Any person may within three months from the date of th, first appearance of this Advertisement in the Antigua, Montserrat and Virgin Islands Gazette, give notice in duplic(ite at the Trade Marks Office, Tortola, British Virgim Islands, of opposition to registration of any of the said Trade Marks. -subsequent election of members to the said House, I DO HE11EBY, with the approval of the Administrator of the Colony of Antigua, divide the said Colony into the undermentioned nine polling divisions :alla.s the are same bounded and described in the Schedule hereto. Polling Divisions. Description and Boundaries. East by East Street and Hyman Road; West by Saint John's Harbour and including Rat Island and the causeway. WNest by Saint John's Harbour. South by the Parish boundary of Saint John with the Parish boundary of Saint Mary. North East and East by a line in extension of South Street westwards to the Sea, the Ottos Road from its junction with Market Street and South Street as far as its jtnction (near to the junction with Camacho's Avenue) with a crossroad (formerly a barricade road) and thence Southwards along this crossroad to where it joins the Valley Road from Saint John and thence Southwards along the Valley road to where it meets the Parish boundary of Saint John near to Creekside. 38 THE ANTIGUA, MONTSERRAT AND VIRGIN ISLANDS GAZETTE [Jaiuatry 30,195.Polling Dsisions. Description and Boundaries. including the Village ef Sea View Farm; West and North West by the Scotts Hill Road to its junction with the Ottos Road and thence in a westerly direction along the Ottos Road to its junotion with the crossroad (formerly a barricade road) leading to the Valley Roid and forming part of the Eastern boundary of the Saint John (Rural) West polling division. East by the Parish boundary of Saint John with the Parish boundary of Saint George excluding the Village of Sea View Farm; West in part by the Sea and in part by Hyman's Road and East Street in the City of Saint John. 6. Saint Mary All that portion of the Island of Antigua comprising the Pariah of Saint Mary. comprising the Parish of Saint Paul excluding theVillage of All Saints. 8. Saint Philip and Saint Peter All those portions of the Parish of Saint Philip. and the Parish of Saint Peter excluding the Villageof All Saints. 9. Barbuda The Island of Barbuda. Printed at the Government Priating Office, Antigua, Leowqaxd Islandp, by EARL PYGOrT, Aoting Government Printer.-By Authority.